Jack Crisp was one of just four Magpies to play all 22 games in 2015. 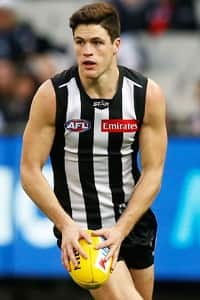 Jack Crisp needs to spend another 25 years at Collingwood to equal the amount of time that Gavin Brown spent associated with the black and white. While Crisp and Brown are polar opposites in terms of their amount of time at the club, few will dare to criticise Crisp on the impact he’s had during his first year at the Holden Centre. Tonight he walks away with suitable reward for a remarkable debut season as the winner of the Gavin Brown Desire Indicator Award. Formally known as ‘The Wrecker Award’, the Gavin Brown Award recognises the player who has performed the most desperate acts or one-percenters throughout the course of the season. Nick Maxwell is a four-time winner and Luke Ball has received the honour on a pair of occasions. And now in Crisp there could be a new kid on the block. After being traded from the Brisbane Lions as part of the Dayne Beams deal at the end of 2014, Crsip quickly made his mark at Collingwood this season. Despite playing just 18 games in the first three seasons of his career, Crisp quickly added 22 more to his tally after being one of just four Magpies to have played every game in 2015. He met his former team in round one and immediately made his intentions felt as collected 12 possessions, five tackles and four one-percenters. Immense tackling pressure became a weekly feature of Crisp’s game. He led the Magpies’ tackle counts in rounds three, nine and 15 and trailed only captain Scott Pendlebury as the Collingwood player with the most tackles in 2015. He kicked 16 goals in 22 games, averaged 22 disposals a game and won a number of run-with battles against some of the best midfielders in the competition. In days past, Crisp would have suited the title of ‘the wrecker’. However with clean skills and an impressive football IQ to go with his hard-nosed attitude, the 21-year-old perfectly fits the bill to be presented with an award in honour of Gavin Brown.